Designed by Jerry Busse of Busse Combat Knife Company and produced by Swamp Rat Knife Works, the Swamp Rat Ratmandu or RMD turned out to be one of the company's most popular designs. Built with tactical quality, the RMD's size makes it a good match for the outdoorsman. The RMD is strong enough for tough camp chores and reliable enough to qualify as a survival blade, but it's still compact enough to carry comfortably on the belt. Exact measurements vary slightly from knife to knife, since the RMD is a semi-custom product. Overall length of 10-1/4 inches includes a drop point blade of 4-3/4 inches. Made from high carbon tool steel a full 3/16 inches in thickness, the knife receives a special heat treatment to increase resilience and maintain a high quality cutting edge. That edge depends on SR101 steel, not famous for corrosion resistance, so the build includes a tactical epoxy coating that seals the blade away from chemicals and weather damage. Textured micarta handle slabs join to the knife's full width tang with three strong steel tube rivets. The profile of the knife includes a dropped bolster and finger choil along with a grip shaped for long-term heavy use. Handle slabs for the RMD were shaped first and textured later, ensuring the most comfortable and most efficient grip. 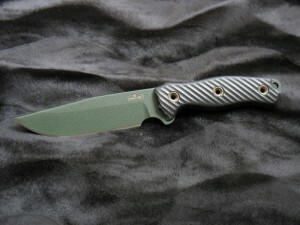 The Swamp Rat Ratmandu is not an occasional-use knife -- it's a blade meant for hard jobs and long hours. Originally made by Becker Knife and Tool but now a Ka-Bar product, the Becker BK9 Combat Bowie offers enough blade for heavy chopping.